Freelancing in America. Arguably the most comprehensive report on the freelance economy. The headline statistics come to be cited in almost every article on the freelance economy. The survey investigates data like the number of people freelancing, the motivations of freelancers and their opinions on matters such as training. It is conducted by Edelman Intelligence who surveyed 6,001 people for this year’s report. It is commissioned jointly by Upwork — the largest global freelancing website, and the Freelancers Union — the fastest-growing labor organization representing the independent workforce. So far, so normal. You can check it out here. The headline message of the report is that “In the past five years, the freelance workforce has grown by 3.7 million to total nearly 57 million freelancers”. Wow, that’s a lot. That’s the message of this report — the freelance economy is an unstoppable train heading to the future of work. Get on board or get left behind. Over the last five years, people are increasingly making the choice to freelance: 63% of freelancers said they were freelancing by choice rather than necessity, up 10 points since 2014. This increase is driven especially by growth among younger generations and full-time freelancers. Americans are spending more than 1 billion hours per week freelancing — an increase of 72.8 million hours per week since 2015. It seems safe to conclude that the freelance economy is heading in one direction. There are more stats about training, work-life balance, politics, technology and future-outlook and they are also just as positive. Please read the report. It is really short. I won’t persuade you that the authors are being deliberately misleading if you think that I’m misleading you. Read it. The authors of the Freelancing in America report choose to use a certain methodology that paints the picture most favorable to them. In truth, most key metrics of the freelance economy have fallen in the past year, showing that the outlook is not so rosy. This is the 5-year anniversary of the report. That may seem uninteresting — when else do we celebrate the fifth-anniversary of anything? — but it is important to these authors. “For the fifth annual Freelancing in America report, we’re taking a look back to see how things have changed in the freelance workforce since we started doing the survey in 2014”. Every stat in the report either looks at the present-day in isolation, or compares the present-day with 2014 or 2015. This itself isn’t necessarily a bad thing. It would be nice to have year-on-year numbers but is it really that big a problem to not have them? Yes — when the real story is in the one-year comparison. An exclusively long-term view in the report distorts the true findings from this year’s survey. Seeing this chart on slide 11 of the deck was my first WTF moment. I cite the 2017 report almost daily. I have been telling people for a year that there were 57.3m freelancers in the US in 2017. When I saw ’56.7m freelancers in 2018’ referenced in the latest report I knew something was up. It doesn’t take a strategy consultant to tell you that the take-away from that chart isn’t the overall growth. Even being generous to the authors, you cannot claim a huge five-year growth number without the caveat that it declined in the last year. There is another chart (from 2017) that helps reinforce this point. This comes from the 2017 slide deck. An updated version was (un)surprisingly absent from the 2018 deck. 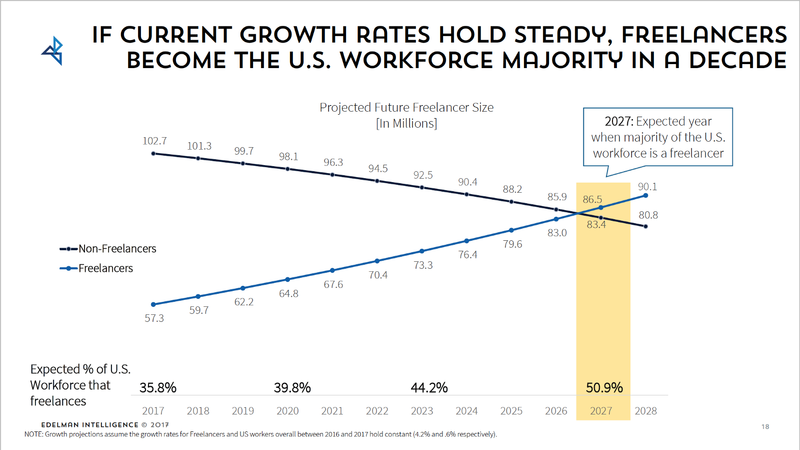 It’s unsurprising because you can no longer make the grand prediction “2027: Expected year when majority of the U.S. workforce is a freelancer”. The number of freelancers in 2018 was 3 million (5%) below the one-year forecast (59.7 predicted in the 2017 report vs. 56.7m actual in the 2018 report). The growth rate of the freelance economy is now in question. That is the real story of this report. There is a lot more to unpack from the 2018 report. Part 2 explores the detailed storyline that comes through when investigating the data further. I also suggest why the authors didn’t share this message. I want to be clear, I believe that the future is freelance. I just believe we’ll only make that happen as a society by being open and transparent. I’ll then post a third blog making the argument for why the growth may be stuttering and what we need to do to get it back. Thanks for reading. Please share this with people interested in the Future of Work. I’m new to blogging and don’t have many followers. I need your help to spread the word and ensure journalists and thought leaders don’t cite misleading stats for the next year!